Color(s): Black, slate, gray, brindle, fawn, red, bronze; spotted or solid. 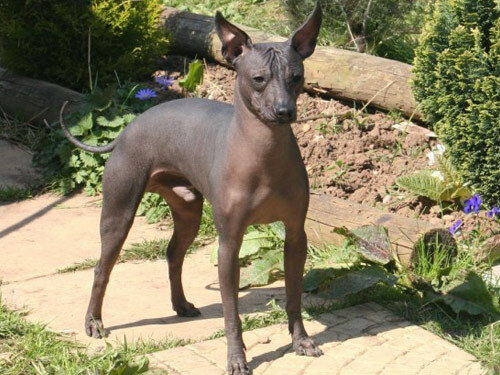 Also referred to as the Xoloitzcuintli, the Mexican Hairless is one of the rarest and oldest breeds in the world. Dating back over 3,000 years, the Mexcian Hairless were highly prizeed for their healing and magical powers. Aztec Indians found this breed useful as bedwarmers, and considered them sacred. Once in danger of extinction, the Mexican Hairless breed was revived and today makes a cherished companion. The most distinctive feature of this breed are the upright, large bat-like ears which provide acutely keen hearing. A primitive breed, the Mexican Hairless is hardy, well-built, extremely agile, and elegant. The Mexican Hairless breed is affectionate, loving, intelligent, and devoted. They are highly protective of their family, home, and territory. This breed is not recommended for first time dog owners. The Mexican Hairless breed typically does not bark. Instead, they emit a howl to alert their family to danger. They do best in a home with older considerate children and dogs they have been raised with. They may be aggressive toward dogs they do not know. The Mexican Hairless breed is a sensitive and emotional breed that demands an inordinate amount of attention. They will become destructive if left alone for extended periods of time, and are prone to digestive problems and neurotic behavior if they become stressed. The Mexican Hairless breed is not suited for cold climates, and requires a sweater in cooler temperatures. The health of the skin is extremely important. Only bathe this breed when absolutely necessary, as over bathing can harm the skin. While it is also important to use lotion and sunscreen on the Hairless variety, caution must be exercised. Too much lotion or sunscreen results in clogged pores and acne. The Coated variety of this breed requires very minimal brushing. The Mexican Hairless is prone to such health issues as early tooth loss, allergies to food, skin infection, and drug sensitivity. The Mexican Hairless comes in two varieties: Hairless and Coated. The Hairless only possesses a short tuft of hair on the head and tail. The skin is smooth, soft, and sufficiently hardy to withstand the elements. The Coated variety has a full coat of hair that is short, sleek, and glossy. This breed is non-shedding and odorless. Early and intense socialization is an absolute must. The Mexican Hairless is quick to learn but requires a dominant handler. It is important that training be done with respect, love, firmness, fairness, and consistency. The Mexican Hairless excels in agility, obedience, and as service and therapy dogs. The Mexican Hairless breed is well suited for apartment living. They are relatively inactive and enjoy going for securely leashed walks, sunbathing in a securely fenced yard, and spending time with their family. It is important that during any outdoor activity this breed is appropriately covered for the climate.